ALBUQUERQUE, N.M. — The U.S. Department of Energy (DOE) chose Sandia National Laboratories as one of five leads in a pilot that will give small, clean-energy companies access to national laboratory expertise and resources. Sandia will receive $2.75 million of DOE’s $20 million investment to launch the voucher pilot for small business assistance and collaborative research. “Our pilot, which we’ve named Tech Assist Green (TAG), unites the three NNSA labs — Sandia, Los Alamos and Lawrence Livermore — to provide a broad array of unique assets from the national lab system,” said Jackie Kerby Moore, TAG team lead and Sandia’s manager of technology and economic development. 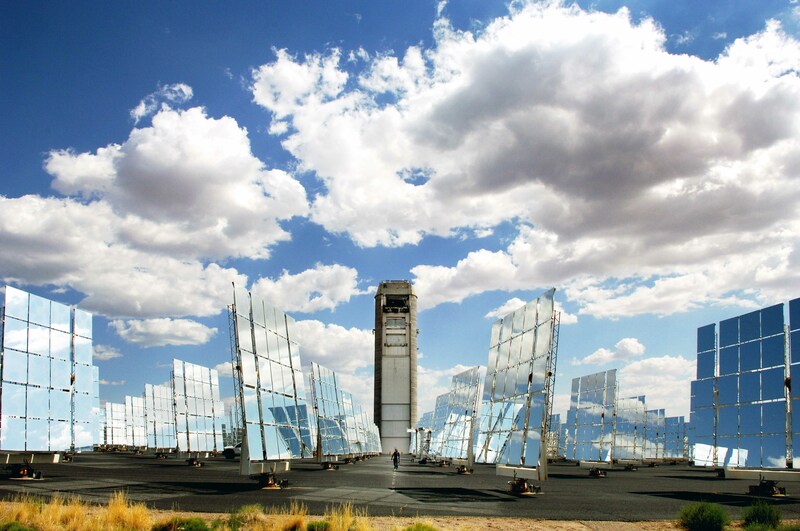 The National Solar Test Facility at Sandia National Laboratories could be used for collaborative research through the Small Business Voucher Pilot. (Photo by Randy Montoya) Click on the thumbnail for a high-resolution image. The Office of Energy Efficiency & Renewable Energy’s (EERE) Small Business Voucher (SBV) Pilot is part of DOE’s National Laboratory Impact Initiative, which seeks to significantly increase the industrial impact of national labs on the U.S. clean energy sector. Sandia was awarded the pilot in the sectors of solar energy, wind and geothermal technologies. Starting in early fall, companies with fewer than 500 employees will be able to apply to Sandia for $50,000 to $300,000 in vouchers that can be used for a variety of technical assistance. The best business proposals will be selected in a competitive process. Successful applications will require the companies to provide a 20 percent cost share. Sandia’s laboratory in Livermore, California, was named one of three partners, along with the Lawrence Berkeley and Lawrence Livermore national laboratories, in LabSTAR, an SBV Pilot for battery, fuel cell and geothermal technologies, and advanced manufacturing. EERE says the technical needs of U.S. clean-tech small businesses include engineering design, modeling and analysis, unique materials, prototyping, scale-up of samples and processes and technology testing and evaluation. The vouchers will increase small business access to cutting-edge lab research and help labs and the private sector work together to bring the next generation of clean-energy technologies to market. SBV is the latest element in a technology transfer strategy that seeks to deploy the results of Sandia’s publicly funded research and development for the U.S. public good. Sandia tech transfer efforts include NMSBA, Entrepreneurial Separation to Transfer Technology, the Sandia Science & Technology Park, collaborative research, intellectual property licensing, and the Center for Collaboration and Commercialization, or C3, which will offer programming and services to strengthen partnerships, technology transfer and ties to the community. Click here for more information on Sandia’s technology partnerships.